Entune Audio with 6.1-in. Touch-screen display. Sporty front fascia with gloss-black, mesh-pattern grille. 17-in. machined alloy wheels with black-painted accents. Leather-trimmed steering wheel with audio and phon controls. Multi-LED headlights with LED accent lights. Power tilt/slide moonroof with sliding sunshade. Available Entune Premium Audio with Integrated Navigation and Entune App Suite. Smart Key System on front doors and trunk. Driver and front passenger heated seats. The Corolla's sleek and sporty exterior is built for those who refuse to fit in. It allows its driver to stand out. The sporty exterior paired with the Bi-LED headlights really completes the look. These lights shine bright and use less energy compared to the standard headlights. 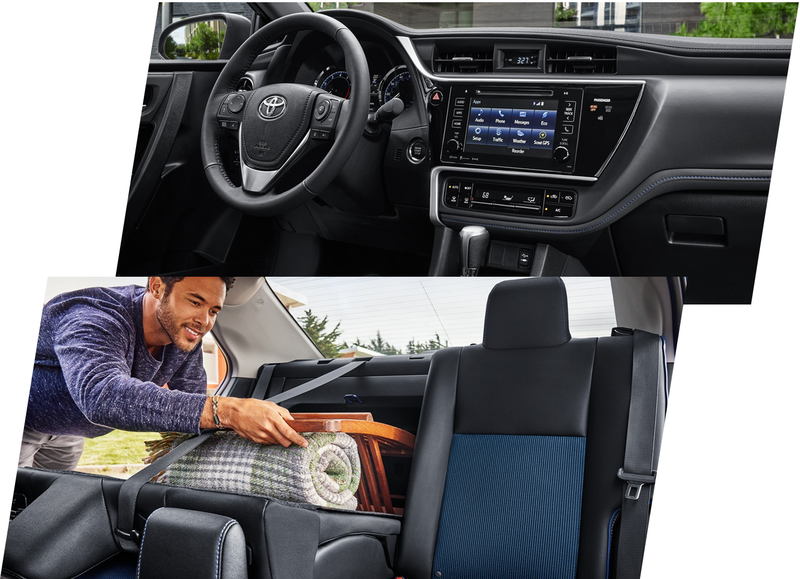 The Corolla interior is designed to be elegant and comfortable. Within the Corolla there are SofTex seats that combine luxury and science. The SofTex seats are water and stain resistant. Plus they are great for long road trips. The Corolla has tremendous efficiency. This is because has an EPA-estimated 40 highway mpg and 30 city mpg. The Corolla LE Eco allows for a driver to take long trips and visit only a few gas stations. The Corolla LE Eco was built with a thirst for adventure, not fuel. In each new Corolla there is now a push to start button with a smart key system. This allows the driver to unlock the front doors and truck while starting the vehicle with just a push of a button. The integrated back up camera helps drivers see what's behind them while backing up. This can be useful when parking or backing up. The Entune Audio Plus will allow you to have turn by turn directions while paired with a compatible smartphone. The Entune Audio Plus System features a 7-in high resolution touch screen display with an auxiliary port and Siri Eyes Free. In a Corolla, there is integrated Bluetooth technology that lets you take calls and stream your entire music library. Plus Corolla's also have a USB port which helps you power up your device. The Corolla has eight standard airbags that are part of a system designed to help keep you safe. Each Corolla is equip with Toyotacare. Toyotacare is devoted to safety and dependability, and proper maintenance is important to both. There is a no cost maintenance plan with a purchase or lease of every new Corolla 2 years or 25,000 miles, whichever comes first. It also offers 24-hour roadside assistance for 2 years, regardless of milage. Each Corolla has a tire pressure monitor that alerts drivers when their tire or tires are critically underinflated. This device is standard in all Corolla's. The Star Safety System is built in every new Corolla. The Star Safety System is an advance integration of active safety technologies designed to enhance traction, braking and more. The Corolla will help avoid accidents and other damage.